Let’s get going already! Oh and make sure to check out the first article written here on Guitarhertz.com about Eric, get right back once you’re done cause this one will give you some thoughts and possibly new questions as to who the bluesman Eric Clapton really is. In fact he had an imaginary horse and was so dedicated to the imaginary things in life, that the idea was completely real to him Eric named the horse Bush Branch and would tie him up outside the house. Don’t feel so bad about day dreaming in class now, do you? “I was different or I knew the kids at school treated me as different or inferior and I had a massive inferiority complex and didn’t know why” Pretty sad to think at such a young age somebody so talented and filled with emotion would be bullied and shown to be less than others but who’s laughing now I’m sure Eric is! Make sure to stay strong guys no matter what kind of critiques are out there, do your thing. Eric’s mother was not the greatest mother at all in fact she was never much of a mother at all. She became pregnant one night after a one night stand, low and behold little baby Eric was on the way. Although because of the pressures of being a single mother in the late 40s his real mother ran off to Canada to be with a Canadian serviceman she met one night in England. His metaphorical parents were really his grandparents and his sister became like a mother figure. When he was told about all of what happened he was hurt and distrusting of everybody in his life, and felt his life up until that point was a lie. It wasn’t until his late 20s he met his biological mother again and she denied to be his mother saying “I think things should stay the way they are”. Sometimes the largest losses in life lead to the strongest strengths like I said before stay strong people. I’m sure you’ve heard of most of them besides well, The Roosters he was playing with them during 1963 but it might be a mystery to you because most of their playing was rehearsal. 8 months later he joined the infamous group known as The YardBirds leaving them behind nearly 2 years later in 1965. Then joining Blues Breakers his break out band with their most popular album referred to as “Beano” but, that venture didn’t last very long either. Considering he joined a band named Cream a 3 man group that became one of the largest bands in the music scene at the time. Yeah, if your head isn’t swirling after that I don’t know what will do it for you. Four different bands four years, crazy it took him so long to find his solo voice. This song was quoted by Tommy Emmanuel to be a simple but amazing arrangement and, says how personally he is very envious of the people who write such simple but beautiful arrangements. Continuing on to say how hard it is to actually pull off something like that. Written by Eric for his son Connor that died by falling 53 stories from a hotel balcony at only 4 years old, for his mother Lory the memory is as fresh as the day it happened. Make sure to watch this classic tribute to a soul gone too soon. Okay maybe I lied being unable to point out one composition. Because this one is really great and the chorus stays with me to this day “The only time I’m happy is when I play my guitar” You may have heard it maybe not, either way make sure to give it a listen. 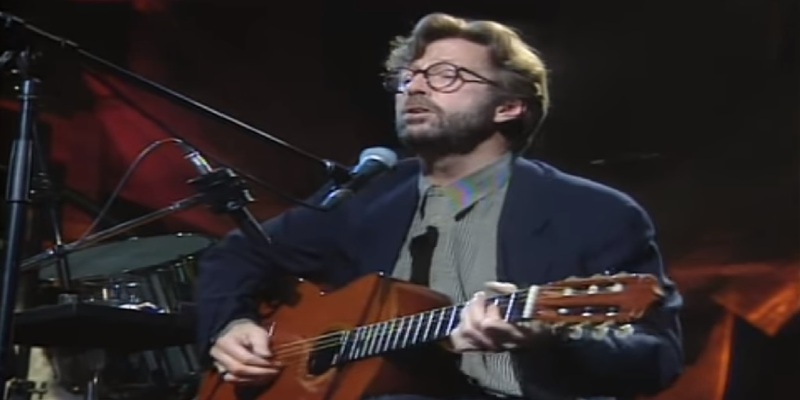 All sourcing was gathered from the movie documentary Eric Clapton Life in 12 Bars definitely worth checking out. That’s it for me Guys! Have a beautiful day or night.